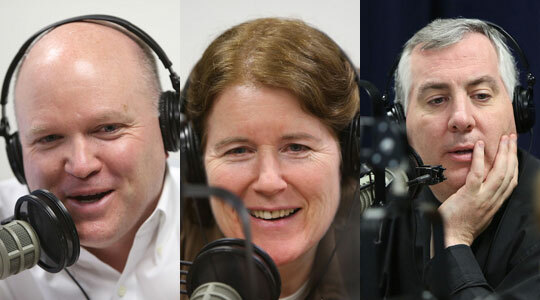 Summary of today’s show: For the past 25 years, Colbe Mazzarella has organized hundreds of people for a Good Friday Way of the Cross for Life through Boston, stopping at churches and in front of abortion clinics to pray for the end of the awful practice and offer reparations for their sins and those of our country and the world. Scot Landry and Fr. Mark O’Connell discuss with Colbe how the Way of the Cross has grown over the years into three simultaneous walks averaging about 400 people giving witness through the city. In preparation for Palm Sunday, Scot, Fr. Mark, and Colbe read and discuss the lengthy Passion narrative. 1st segment: Scot welcomed Fr. Mark to the show. On today’s show, we will be hearing and discussing the Passion narrative for Sunday, but first we’ll talk to Colbe Mazzarella, organizer of the Way of the Cross for Life. Scot said the US bishops have asked everyone to pray and fast for religious liberty and protection of conscience. If everyone hasn’t heard that yet, they could pray with us this prayer from the US bishops’ website. 2nd segment: Scot and Fr. Mark welcomed Colbe Mazzarella. Scot congratulated hero n the 25th year for the Way of Cross for Life. It started when she read a newspaper article about someone starting a similar walk in California. She told people what a good idea it is and when no one else started it she did. On Good Friday, they walk and stop and pray in front of several churches and abortion clinics, following three different simultaneous routes. They start at 9 am and usually end by noon and so people go on to a Good Friday service. They walk through Boston and Brookline and East Boston. Colbe noted how often as the people walk, praying not protesting, they get a good response from those who see them. Scot said the Good Friday connection helps people to acknowledge their own sinfulness, especially as it relates to the topic of abortion. They offer up reparation for our sins and the sins throughout the world. Colbe said reparation means “to repair” something bad that has happened, and abortion is something bad that is harming our whole culture. We need to make reparation as a whole nation. Scot asked how it’s different now from 25 years ago. Colbe said for her, she started pushing a stroller with her baby and now he’s a math teacher. Over the years, they’ve added reflections to the traditional Stations of the Cross that include a pro-life meditation that goes with each station. In Boston they start at Government Center. In Brookline they start at Planned Parenthood on Comm. Ave in Allston. In East Boston, the begin at Holy Redeemer. That walk ends at the Madonna Shrine. Colbe said attendance does fluctuate with the weather, but there’s usually 400 or so who are usually there. The East Boston walk is more of a neighborhood event. In downtown Boston they walk through the business district and end up at the Cathedral of the Holy Cross. The Brookline/Allston walk mainly follows the streets of Allston. Colbe said Most Holy Redeemer is mainly Spanish speaking, so the prayers alternate Spanish and English. It has a touch of Latin cultural flavor. You don’t have to sign up. Just show up at one of the starting points. Scot asked about the ups and downs of doing this ministry over 25 years. Colbe said having something that happens on a particular day every year makes it easier over something that’s more open-ended. Having people who are meeting on a schedule is very important, whatever volunteer ministry you lead. Colbe said the walk is a mirror of what Jesus did: walk through the city with some people they pass for them and some against. It also keeps Jesus’ suffering as something timeless, connecting the suffering of Christ with the troubles in own lives and our place. Fr. Mark ask if people are really against them and Colbe said they do hear awful things yelled at them. In response, they respond like Christ, silently and praying for the person. Scot asked what a difference it’s made in her children’s and grandchildren’s lives to make such a public witness of their faith. Colbe said it’s great to start when they’re young so they don’t see it as unusual. Her kids walk right up front holding the banner and later in life they’re used to stepping up. When they see someone being negative, they see one angry individual versus a large group of prayerful people. They’ve borrowed the Holy Thursday tradition of the station churches. At each church, they go inside and say two of the stations. They also have Bible readings, going verse by verse through Salvation History, from Genesis to Revelation. Some of the stops include the Paulist Center, St. Thomas More chapel (even though it’s closed now), St. Anthony’s Shrine, St. James in Chinatown, Holy Trinity, and the cathedral. At the cathedral they make the same two stations, but are led by Cardinal Sean. This year it’s in the downstairs chapel. They discussed the renovations that have happened in the cathedral, including the beautiful chapel. They also discussed the various languages prayed in the cathedral. Colbe said most people walk the whole route, but people do join along the way. 3rd segment: Now as we do each week, we look forward to the readings from this Sunday’s Mass. We will hear the Gospel of the Pasison Narrative read in four voices. “hat further need have we of witnesses? Scot said when he prays this on Palm Sunday and Good Friday, it’s always difficult to shout as part of the crowd. But it drives home our own sin. Colbe said we do crucify Christ when we sin and so it’s only appropriate that we are the ones to voice that. Fr. Mark said most priests don’t preach a long homily after this, but usually emphasize the entry into Holy Week. But a few interesting parts include the line about the young man wrapped in a linen cloth, who some say was the author of the Gospel, St. Mark. It doesn’t say it’s Mark, but why is it in there? Other possible appearances of Mark might be the rich, young man and the young man who peers into the empty tomb on Easter Sunday. Scot noted that effects of nature, when true darkness falls over the land, earthquake, the veil in the Temple being torn in two. We could have been one of those shouting for the crucifixion, but we could also be the pagan centurion giving testimony, having witnessed the three hours darkness and the momentous events. Why is it just the single voice who reads this line? Colbe said it’s always fewer who see Christ for who he is. But we are often both those who call for the crucifixion, and also those who express our belief. Scot said thinks about how often we are faced with choosing Jesus or Barabbas in our life, i.e. something that is a replacement for Jesus. How often do we choose not-Jesus? It could be as basic as praying more or watching television? Listening to Catholic talk radio or sports talk radio. Fr. Mark said we could be Pilate, who finds his way out and not understanding the full consequences of what he does. Rick Heil, producer, said we could be Simon Cyrenean, the bystander called from the crowd to perform a minor but extremely important role. People are often willing to step up and help if only they’re asked. Scot said Judas comes off worst in this reading, but second worst in Peter. Eventually Jesus gives Peter a chance to repent, to choose Christ instead of himself three times, and then making him Pope. We can never do something that Jesus won’t forgive. Choose Peter’s way, not Judas’ way. Colbe said the biggest difference between Judas and Peter is Judas wouldn’t turn to Jesus, couldn’t believe in forgiveness. Scot said the Agony in the Garden often gets overlooked in this long narrative, but there are important choices in that scene. For instance, the apostles couldn’t stay awake and pray with Jesus for three hours. Sometimes we need to give our attention and best effort to accompany him in prayer. Let him accompany us. This was a gift to the apostles, to be in Christ’s presence in that moment. Fr. Mark said we should pledge to spend time during Holy Week with Christ in the garden. Perhaps that could include the Way of the Cross for Life.